When Trucks Are Overloaded, Rubber Encased Leaf Spring Bushings Become Stressed Over Time. Worn Bushings Can Lead To Improper Tracking And Poor Stability On Turns. Rubber Encased Leaf Spring Bushings Play An Important Role In The Handling Of Your Vehicle. Dry Rotting Or Swelling Of Leaf Spring Bushings Are A Sure Sign It's Time To Make A Change! 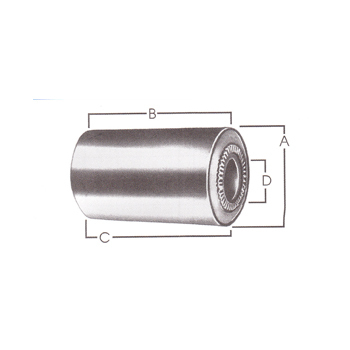 WHEN YOUR SPRING EYE BUSHINGS FAIL OR JUST NEED REPLACING WE HAVE WHAT YOU NEED! 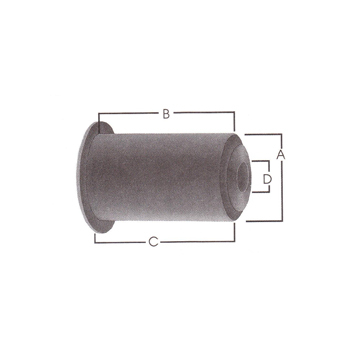 ATS Springs Offers Rubber Encased Leaf Spring Eye Bushings In A Variety Of Sizes. Rubber Encased Leaf Spring Eye Bushing, Original GM # 3887751. Rubber Encased Leaf Spring Eye Bushing, Original GM # 3888968. Rubber Encased Leaf Spring Eye Bushing, Original GM # 3941634, J3232169. Rubber Encased Leaf Spring Eye Bushing, Original GM # 3952023. Rubber Encased Leaf Spring Eye Bushing, Original GM # 6262585. Rubber Encased Leaf Spring Eye Bushing, Original Gm # 332721. Rubber Encased Leaf Spring Eye Bushing, Original GM # 15529515. Rubber Encased Leaf Spring Eye Bushing, Original GM # 15588650. Rubber Encased Leaf Spring Eye Bushing, Original GM # 15588651. Rubber Encased Leaf Spring Eye Bushing, Original GM # 15659690. Rubber Encased Leaf Spring Eye Bushing, Original GM # 15659691. Rubber Encased Leaf Spring Eye Bushing, Original GM # 15739091. Rubber Encased Leaf Spring Eye Bushing, Original GM # B7C5781A.